World’s first aquacultured Zebrasoma flavescens to reach market size, prior to shipping from the Oceanic Institute at Hawaii Pacific University. Image: Chad Callan. Among the pampered celebrities landing discreetly out of public view at LAX in the first week of March will be a Styrofoam-packed shoal of 300 to 400 terrified youngsters traveling under the name of Zebrasoma flavescens—the world’s first captive-bred Yellow Tangs to reach commercial size and the aquarium trade. 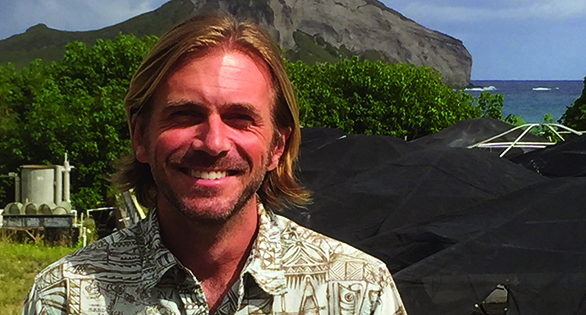 Chad Callan, Ph.D. at the non-profit Ocean Institute at Hawaii Pacific University. Hobbyists should not get their hopes up about acquiring one of the first CB Yellow Tangs, as most of the first shipments are already destined for public aquarium exhibits. Even these are not likely to appear immediately, says QM’s Fleishauer, as they will be held for conditioning, while some will be grown to larger sizes. “Aquaculturing any marine fish is a daunting task, and surgeonfishes of all sorts have proven to be a tremendous challenge due the extended larval pelagic periods during which they are especially difficult to feed and house,” says Fleishauer. “The successful rearing of these fish is an incredible milestone to pass, and its promise for the future aquaculture of this and other species is incredibly encouraging. This promise is what makes it extremely important that we continue to support Rising Tide. 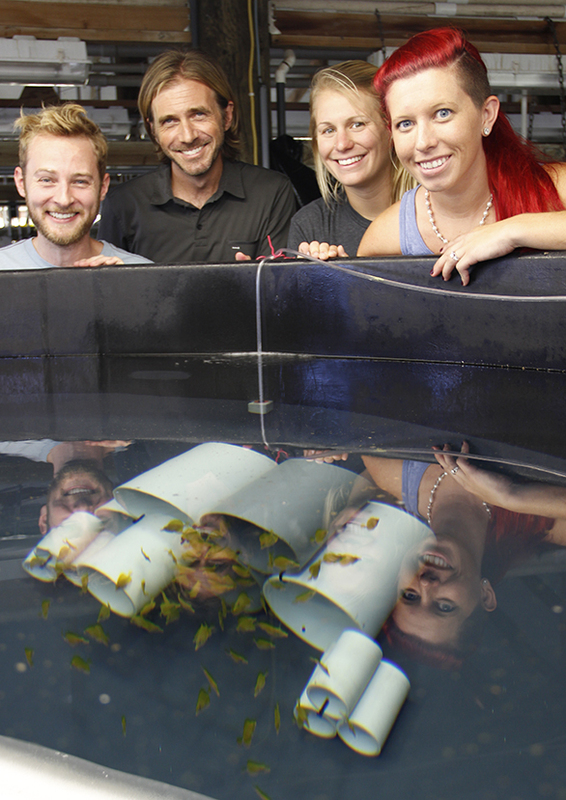 The OI Yellow Tang Project crew, left to right: Dean Kline, Chad Callan, Emma Forbes, and Erin Pereira-Davison. 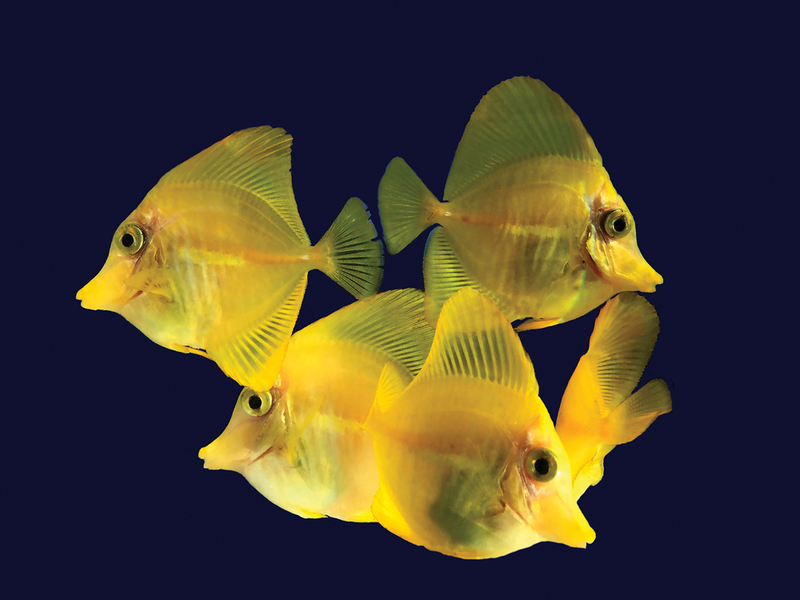 It is estimated that the price tag on the early aquacultured tangs may be double that of wild specimens. Says Callan: “We are pleased to partner with Quality Marine and Segrest Farms, and consumers can be assured that all proceeds from these sales will directly support the research necessary to further refine this technology and apply it to other surgeonfish species. A fresh breeding run may be starting soon, but Callan says that future supplies are not a certainty. MARCH 8th UPDATE: The first graduating class of Zebrasoma flavescens have arrived at in the mainland United States and are in quarantine at Quality Marine, Los Angeles, and Segrest Farms, Florida.